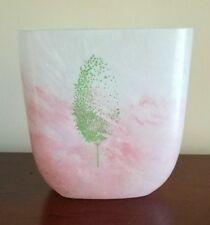 Stunning handcrafted signed “MAYTREE” SEASONS SERIES ART GLASS (Kosta Boda) VASE. 6.375”H x 6.25”W x 3.25” D by artist Kjell Engman and numbered Boda 48636 K. Engman. Excellent condition and beautiful when light passes through. Maytree Theme. Circa early 1980’s, Vintage Original - Crystal - Made in Sweden. Please contact with any questions or offers. Thanks so much! Made By Hand In Daum France. Fine Crystal - Contains Almost 30% Lead. SIGNED BY :B. VALLIAN, HAS ORIGINAL STICKER AND IS NUMBERED 48174. MADE IN SWEDEN, MARKED ON THE BOTTOM. KOSTA BODA ART GLASS VASE. Beautiful Bud Vase. Label intact. Stunning Daum Pate De Verré Crystal Iris Vase. • Daum Crystal Makers Since 1878. •Marked Daum France to the bottom. •Iris floral 3D motif/design flowing from the vase in tasteful purples and yellows. • Made in Nancy, France Mid 20th Century. "The Gondolier" Orrefors Ariel Art Glass Vase. Original Orrefors Sticker. Heavy Cylindrical Art Glass Vase. Colors Are Rich Shade Of Blue, Amber, Green And Clear. One does have what looks to be a small restoration shown in pic 8. They are 3 5/8" x 3 5/8" at the top. Beautiful frosted crystal vase. Decorated with hand painted pink, green and gold gilt Art Nouveau clover and clover flowers design. With gold gilt and green scrollwork along the rim. Probably made by Fritz Heckert. Lovely inside painted Crystal. This is thick and heavy and quite striking. 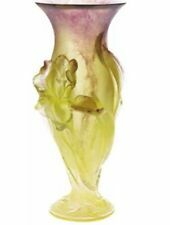 Has a small tube the back to sue as a flower holder if you so desire. Each is hand signed in the glass and dated to certify authenticity. "Adam Jablonski is famous for his glass art, but he is also a highly respected glass technician. Adam Jablonski Lead Crystal Vase. He retired in 2010. Vase is signed on the base but I cannot decipher the signature. Still has a paper label that reads: Unique Crystal PBO 24% hand Made In Poland. Beautiful block glass vase cased handbag Natalie model, Murano. Know what you are purchasing. Family Owned And Operated Glass Studio In Iowa Known For Beautiful Stained Glass. This is an elegant and unusual iridescent pebble design art glass vase by Rick Hunter. The vase is in cobalt dark blue color with iridescent pebble design art glass in the center body. Photos show all 4 sides of the vase. Signed with original stickers in tact. The Design by Bertil Vallien. This Vase Was In Production From Mid 1970's-1982. Made In Sweden. BEAUTIFUL GLASS VASE WITH BLUE RUFFLE RIM AND TURQUOISE INTERIOR FROM CZECH REP. This is beautiful handmade Czech Republic glass vase with a ruffled cobalt glass rim and an interior of turquoise glass! It stands 11" at the tallest point, 6"at the widest ruffle. This beautiful glass vase, handmade by SEA of Sweden, is a superb example of the firm’s style and a highly collectable piece for display or use. The artist’s signature of ‘RS’ and ‘AL’ is present to one side and the original ‘SEA of Sweden Handmade’ label is also present. CZECH BOHEMIA CRYSTAL GLASS. Our products is very top quality and very beautiful! Beautiful heavy glass bowl dish, glasses, plate and ladle has fantastic design and very luxury look. It is hand made and hand cut! This is a really beautiful, finely crafted piece of crystal art glass in the form of a Very Tall and Heavy Colorful Leaf vase. Their creations have been given to countless heads of state and dignitaries from around the world. Original Sticker - Handmade Boda Kosta Boda AB Sweden. Kosta Boda Art Glass Bottle Satin Finish. Beautiful Pulled White Cloud Pattern Flowing Into Blue Neck. It's heavy weighing almost 5lbs. Not sure how old it is. Has a sticker on bottom that reads: Handmade BADASH China. It is in excellent condition. Authentic Cristal de Paris from France. Choose color. Reference: 6123/P Rose or 6123/S White. Daum Crystal Vase. Signed by Daum. Very heavy vase. We attribute this piece to Giuliano Toso. 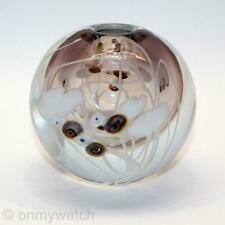 There are air bubbles as is common to blown glass. The vase also shows surface scratches and nicks consistent with age and use. This beautifully executed piece showcases swirling panels of canes interspersed with bold orange. It shows minimal surface scratches consistent with age and use. The clear parts show as faint yellow or pale green in the photos. Marked with a sticker that says: HAND MADE AVITRA CRYSTAL. -Add this pretty vase to your display collection. -Clear, deep pink/red, white, light and dark green. Once we receive the item, we will credit back the final price of the item. Featured for your consideration is a gorgeous MCM Murano Art Glass triple gourd vase in turquoise accented with streaking lines. MADE IN ( WARSAW ) POLAND. Amazing Vintage 1950s Murano • Venetian Italian Art Glass Millefiori • Murrines Basket Vase Many Colors! • Satin/Frosted Finish • Undamaged • Murrines • Canes Made in Murano, Italy OnMyWatch is proud to offer you this gorgeous old Murano millefiori basket vase by Fratelli Toso. An amazing collection of murrines & canework with a satin finish. It's really a jaw-dropping piece as you'll see in the photos. Tremendous amount of activity in a small package! Pontil/base is made ground-flat and shows the expected shelf-wear from age and careful movement. Excellent addition to an art glass collection, or a thoughtful gift for a special person--including yourself! DIMENSIONS: 5¼" tall (13.34 cm) x 5" d x 3½" w WEIGHT: 7 ounces CONDITION: Excellent vintage condition! No damage. Signed Tony Cray 1989 Art Glass Vase. Snake Ranch Studios. Pear Shape. Gorgeous Saturated Color Overlays. Hand made. Size: 12”. For condition see photos. Scarce and collectable item. Multicolor Pastel Swirl MURANO GLASSWARE Crystal Clear Vase Italy 12"
If, by chance, not in a pair, the single lustre was exhibited on a pedestal. Always created in pairs, lustres were too often separated when estates were settled; for example, one lustre would go to the eldest daughter, the second to the youngest daughter. Signed Steven V. Correia 1981. Lovely Iridescent Pulled Feather Design. Limited Edition 55/250. This Hand blown vase has a wonderful modern bulbous shape. x 1 1/2" Dia. at opening x 4 1/4" Dia. at widest x 2" Dia. Marked with oval gold foil label, and fire polished edges & polished bottom. Though the treasured art objects were created in pairs, too often, when estates were settled, the lustres were separated — one left to each of two daughters. Lustres continue to be expensive to collect, thus another reason for their continued separation.